Or why Donald Trump’s Great Wall Is Viagra for him, but a border disaster. Borders are cruel. I know this because I’ve been studying the U.S.-Mexico border for more than 40 years. It features prominently in two of my books, written in different decades. It keeps pulling me back. Every time I cross that border, I say to myself that this is no big deal – I’m used to it. And every time, I feel that familiar fear-or-flight jolt of adrenaline and hear the inner warning: Watch out! Things go wrong here. Unsolvable predicaments like this require management – continuous care, if you will – in the same way that chronic disease or steadily rising sea levels require it. Our efforts to manage the situation can be wise or stupid, mostly benign or downright sadistic, cost-effective or absurdly wasteful, realistic or hallucinatory. The task facing this country is to make it less awful and more humane than we have so far shown much talent for doing. For every complex problem, there exists a simple solution – which is completely wrong. In the case of the U.S.-Mexico border, Exhibit A is the president’s proposal to build a 30-foot-high (or 55-foot-high), 1,900-mile (or 1,000-mile) wall – the president’s numbers vary with the moment – to provide security. The imperative behind his fixation arises from his boisterous, demagogic, and chronically over-counted political rallies. More than Fox News, more than the sycophants who surround him, the rallies are the mirror before which he preens. They are his political Viagra, a drug that takes effect when the crowd begins to chant. Even two years into his presidency, Trump can’t stop talking about Hillary Clinton and, when he mentions her, his admirers rock the rafters, yelling “Lock her up!” It’s the MAGA mob’s way of reconfirming that he hates who we hate, which is the DNA of Trump’s appeal. 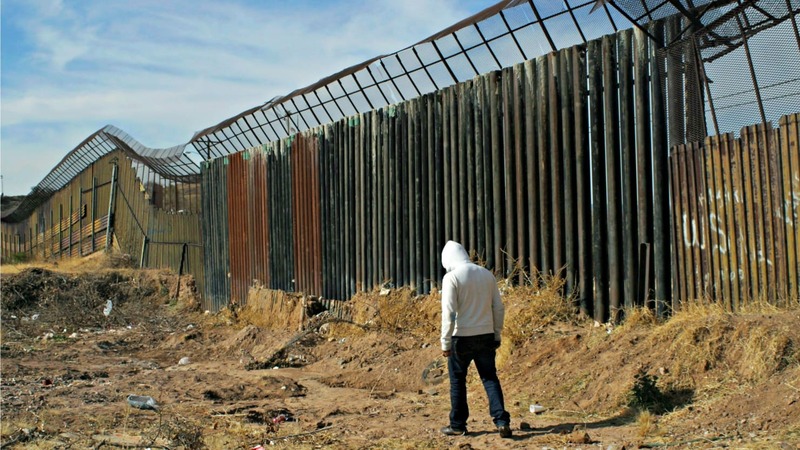 In the mid-1990s, when the Clinton administration launched Operation Gatekeeper and began building walls to curb illegal entry, the typical migrant was a Mexican male seeking work in the U.S. The idea behind Gatekeeper was that, by walling off the border in urban centers like San Diego/Tijuana and El Paso/Juarez, migrants would have to cross through desert so inhospitable that they would desist. Of course, they didn’t. Crossing just became more arduous and expensive because a migrant now needed a guide – a coyote – to find his way through harsh terrain and reach contacts on the other side. So here’s the rub: the infrastructure of the border is designed to deal with young Mexican men seeking work, not families, including young children, who arrive destitute and often sick. Although the border agreement that ended the recent government shutdown authorized upwards of $400 million for new facilities – the total is debated, with some Republicans arguing that as much as $750 million might be available – adequate structures don’t yet exist. And so people, often children, have been held in cages in jury-rigged, overcrowded, and distinctly punitive facilities. Ports of entry could be equipped and staffed to process asylum requests quickly and in volume instead of the “metered” trickle that is current practice – sometimes 10 or less a day. The immigration court system also needs to be fully staffed (funding exists for 107 more judges than the 427 currently serving), as well as expanded. The effect of this bottleneck, in an echo of Operation Gatekeeper, is to force groups of refugees into the desert where they cross the border illegally and at great risk (meanwhile distracting Border Patrol officers from legitimate law enforcement duties). Once in the U.S., they surrender themselves so that their cases will have to be addressed. But until Trump came along, both parties ran from the semantics of calling it a “wall.” Officially, it was a border fence. The Clinton, Bush, and Obama administrations feared castigation for applying a second-century technology to a twentieth – and twenty-first-century problem. The optics of being identified with other famous wall-builders – Roman Emperor Hadrian (122 CE), China’s Ming Dynasty (14th-17th centuries), the USSR (Berlin, 1961), or even contemporary Israel – were considered unappealing. Of course, President Trump not only embraced the negative connotations of wall construction, but pretended that the 654 miles of barriers, including approximately 354 miles of wall, erected by his predecessors did not exist.